Sixty weanling Large White×Duroc pigs were allocated to five groups of 12 pigs per group and fed on one of five diets. The five diets comprised 0, 50% and 100% unboiled, sun-dried taro cocoyam cormels (Colocasia esculenta) and 50% and 100% boiled, sun-dried taro cocoyam cormels as replacements for maize. The levels of some antinutritional factors were also determined in both boiled and unboiled, sun-dried taro cocoyam. Boiling reduced (p<0.05) the amounts of the antinutritional factors in the taro cocoyam cormels. 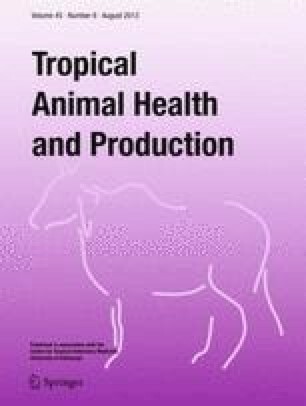 There were no significant differences (p>0.05) in feed intake, weight gain or feed efficiency between the diets containing boiled taro cocoyam cormels. However, for unboiled, sun-dried taro cocoyam cormels, there were significant differences (p<0.05) in weight gain and feed efficiency, these being depressed at more than 50% replacement of maize. This may be due to the relatively high amounts of antinutritional factors in the unboiled, sun-dried taro cormels. Boiled taro cocoyam cormels were comparable to maize as an energy source in the diets of weanling pigs.